Scientists from Scripps Institution of Oceanography at UC San Diego are in the midst of an unprecedented research journey into the vast and little-explored "Great Pacific Ocean Garbage Patch." Called the Scripps Environmental Accumulation of Plastic Expedition (SEAPLEX), this research mission has gotten its first close-up and detailed looks during its 20-day voyage to survey and sample plastic debris in this remote ocean region. The Scripps research vessel (R/V) New Horizon left its San Diego homeport on Aug. 2 for the North Pacific Ocean Gyre, roughly a thousand miles off California's coast. With collaborators from Project Kaisei, the team is surveying plastic distribution and abundance, collecting samples for analysis in the lab and assessing the impacts of debris on marine life. The scientists and research volunteers onboard are seeking scientific data on just how much influence the accumulation of human-produced plastic and other debris has on this ocean area. 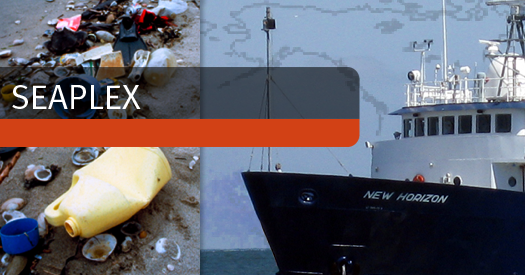 Prior to this cruise, very little was known about the size of the "garbage patch" and threats to marine life and the gyre's biological environment. This cruise will continue through Aug. 21 and is led by a team of Scripps Oceanography graduate students, with support from UC Ship Funds, the National Science Foundation and Project Kaisei. "During the SEAPLEX cruise, we are going to try to target the highest plastic areas we see to begin to understand the scope of the problem," said Miriam Goldstein, chief scientist of the expedition, before the team embarked for the North Pacific Gyre. "The team of graduate students will be studying everything from phytoplankton to zooplankton to small midwater fish." On Thursday, Aug. 6, as SEAPLEX scientists continued towards the North Pacific Ocean Gyre, a large piece of plastic with crabs and fish larvae was retrieved from the water using a hand net. After transiting for six days aboard R/V New Horizon, the SEAPLEX research team reached its first intensive sampling site on Aug. 9, where team members began 24-hour sampling periods using a variety of tow nets to collect samples at several ocean depths. The following day, a manta tow retrieved during sampling included small jellyfish-like organisms called by-the-wind sailors (Velella velella) along with lots of plastic. According to the scientists, "at numerous areas of the gyre, flecks of plastic are prevalent and easily spotted against the deep blue sea water." On Aug. 10, Scripps Institution of Oceanography SEAPLEX researchers dispatched a small boat off R/V New Horizon for two hours to capture plastic debris in the gyre. Among the assortment of items retrieved were three plastic bottles with a variety of biological inhabitants. On Aug. 10, Scripps Institution of Oceanography SEAPLEX researchers dispatched a small boat off R/V New Horizon for two hours to capture plastic debris in the gyre. Among the assortment of items retrieved were three plastic bottles with a variety of biological inhabitants. On Aug. 11, SEAPLEX researchers encountered a large net with tangled rope, net and plastic with various marine organisms attached and also recovered three plastic bottles covered with marine organisms, including large barnacles. On Aug. 12, Pete Davison, a Scripps Oceanography graduate student studying mid-water fish in the gyre, collected several mid-water species using an Oozeki trawl, including the pearleye (Benthalbella dentata), a predatory mid-water fish, which has eyes that look upward so that it can see prey swimming above, and lanternfish (Tarletonbeania crenularis), which swims daily from as deep of 700 meters (2,297 feet) to the ocean surface. "Though we'd been pulling up plastic in our nets for days, seeing it freely floating about, not bunched up in a net, was shocking," said Goldstein in her Aug. 15 Seaplexscience blog post. "The magnitude of the problem suddenly came crashing down on me - how could there be this much plastic just floating in a random patch of ocean a thousand miles from land?" In addition to supporting SEAPLEX, Project Kaisei also has a sailing vessel in the region examining the ocean gyre, collecting and studying plastic and other debris forms from the ocean to showcase new technologies that will be used for processing and recycling. The public has been following SEAPLEX through its daily blogs posted on the Web. Upon completion of the cruise, scientists and supporters from the Scripps Oceanography SEAPLEX expedition will recount their research voyage and discuss initial scientific findings at a press conference at Scripps Institution of Oceanography in La Jolla, Calif., on Thursday, Aug. 27, at 11 am (PDT).